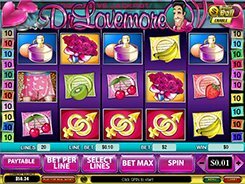 The online video slot Cherry Love released by Playtech consists of five reels and thirty win lines. Red roses, hearts, cherries and other symbols are all about romance and love. You can put a bet on any number of paylines and select a coin size from $0.01 to $5. The top bet is 1500 coins. The passionate woman is a wild symbol substituting for other icons, except for the scatter. Besides, it can expand on any of the three central reels in a vertical direction, thus boosting your winning chances. Cherries are the scatter symbol. 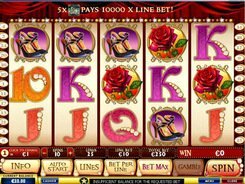 Two scatters anywhere on the reels double your total bet, and five scatter symbols payout your bet times x200 multiplier. Three and more сherries award you 15 free games with a chance of winning more spins during the free games feature. The fresh red rose is the most sought-for symbol that yields a jackpot win of 4000 coins. The heart tattoo brings you the second-largest prize in the slot. After each winning spin you may opt to double your prize. If so, start the Gamble feature where you can increase your winnings, yet you risk losing your spin win. PLAY FOR REAL MONEY!